The mission of the Restoration Ecology Lab's research is to increase knowledge about ecological processes and their application to the restoration of degraded ecosystems. 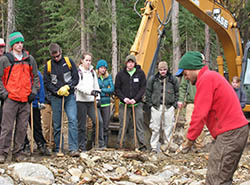 Toward that end, research in Cara Nelson's Restoration Ecology lab at UM focuses on three main themes. View a list of select publications. Cara and her students are interested in vegetation responses to disturbance in biotic and abiotic environments.Ongoing and recent projects include: plant physiological and demographic responses to disturbance, including whether plants of similar functional groups vary in magnitude and mechanism of response; the extent to which changes in biotic environment (e.g., due to invasive plants) are driving natural selection in understory plants; and the extent to which biotic environment (competition) modulates climate-growth relationships in trees. Cara and her students are interested in understanding the efficacy and effects, both target and non-target, of restoration treatments. They are exploring these issues through large-scale observational studies (e.g., assessing 44,000 treatments implemented under the National Fire Plan) and in smaller-scale experiments. Projects include assessing plant responses to fire-mitigation and fuel-reduction treatments, herbicide treatments, and road removal. 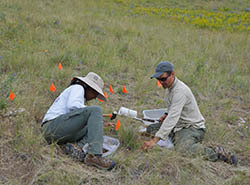 The lab also has expertise in assessing the efficacy of the sampling designs that are used for assessing restoration outcomes, and has undertaken several evaluations of commonly used designs. 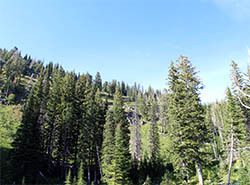 As a relatively young field, the conceptual basis for ecological restoration is still being developed. Cara and her students are particularly interested in the role of history in setting restoration targets, appropriate reference models for ecological restoration, and the management implications of novel ecosystems.